NOTE: If you are a single-monitor user, this is overkill. See Easy LightBoost HOWTO. Surround LightBoost 2D users got a very unpleasant surprise from NVIDIA during Fall 2013. People who upgraded to NVIDIA GeForce Drivers 327.23 and later, lost ability to use LightBoost for 3 monitor surround. 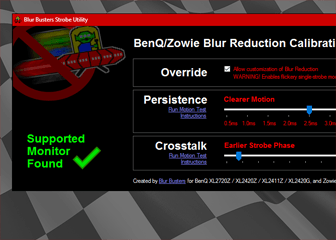 Interestingly, AMD Eyefinity users are unaffected; these users easily use LightBoost with ToastyX Strobelight Utility. Ironically, LightBoost easier to use on AMD than NVIDIA? NOTE: single monitor users are unaffected for both NVIDIA and AMD. 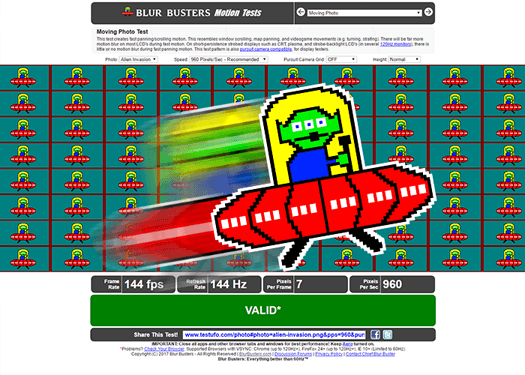 To satisfy upset users sitting on 4-figure investments in NVIDIA products, Blur Busters is pleased to provide a solution, thanks to Toni Wilen, the author of WinUAE (Amiga emulator) who is a triple surround LightBoost user. DISCLAIMER: You are about to make permanent modifications to your monitors. Damage is possible. Injury is possible. Warranties will be voided. Blur Busters disclaims all responsibility for any damage or injury caused by these instructions. PROCEED AT YOUR OWN RISK! These advanced instructions involve opening up your monitor for a minor modification. This is to physically disconnect a write-protection pin for the EDID chip, and then using a utility to reflash the EDID with LightBoost-specific modes (modes containing a larger Vertical Total). You will also need a separate computer running an older graphics card, for the EDID reprogramming part, since a lot of EDID utility software (e.g. PowerStrip for Windows, edid-rw for Linux) only work with older graphics cards. After this process is done, LightBoost will be enabled by default, even at the POST screen at bootup! 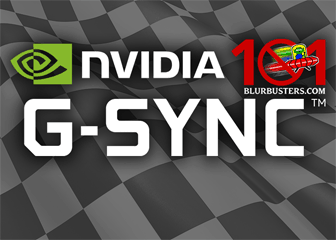 This process should not interfere with the upcoming G-SYNC upgrade, though you may need to re-flash the EDID back to original. Proceed at your own risk. These instructions assume you have the ASUS VG248QE computer monitor, one of the most popular LightBoost-compatible monitors. Other monitors (e.g. BENQ XL2411T) have very close similarities, however, these instructions are only tested on the VG248QE. 1. Get organized. You will need a Philips screwdriver. A soldering iron is highly recommended, however, an ultra-sharp large utility knife blade (fresh, new ‘exacto’ type blade) will also work if you are extremely careful (an accidental slip will do a lot of damage). Make sure your work area is washed/cleaned, as you don’t want dirt getting into your monitor innards. You will be temporarily removing screws, so do not lose them! Get a few sandwich bags, small containers, or several cups, to store loose parts in. 2. Make sure you don’t have static electricity. Touch a grounded metal object (e.g., the metal surface at the back of your computer). Also, make sure your monitor has been unplugged for at least 15 minutes, so there’s no charge left in your monitor’s capacitors. If you are only doing this temporarily, simply stop following the video once you gain access to the interior (5min into video). 4. Lay the the screen face down carefully, with the metal rear of the monitor facing upwards. Make sure your surface is clean and completely clear of debris, so it does not scratch or damage the glass of your monitor. 6. Unscrew the circuit board. Remove the two screws that hold the main circuit board. Upon doing this, you can now see the chips sitting on your monitor circuit board. 7. Find the correct EDID chip for DVI. See attached image, with circle. The correct chip you want is immediately behind the DVI connector. It is a tiny 8-legged chip, and says “ATML” on it as the first few letters. For the electronics geeks, this is the DVI I2C EEPROM chip, an Atmel 24C02C. There are two of them, one for HDMI, and one for DVI. However, we only need to modify the one for DVI. Soldering Iron Method: The use of a electronics soldering iron, with a thin tip, is recommended. Heat the pin just enough until the solder melts, and bend the pin upwards using the soldering iron’s tip (or another pointy metal tool). Do not overheat. Utility/Exacto Knife Method: This method is accident prone, and easily does accidental damage. However, it works if you are careful with the knife method. Use a fresh, new utility kife blade. Carefully and slowly, with light pressure, cut pin #7, by sawing through it gently until it cuts through. Gentle cutting is less accident prone than a hard push (where a sudden slip accident can sever multiple circuits). Use a very sharp, fresh blade, so it is easy to cut the pin with just light pressure, minimizing the chance of a “slip” accident. Note for Electronics Geeks: The ATMEL 24C02C datasheet says the pin should ideally be connected to ground, however, leaving the pin unconnected works too. 9. You’re Done. Reassemble the monitor. Reattach the circuit board (2 screws), reattach the metal cover (4 screws and tape, use new tape if necessary), and reassemble casing if desired (or keep it de-bezelled, during surround use). 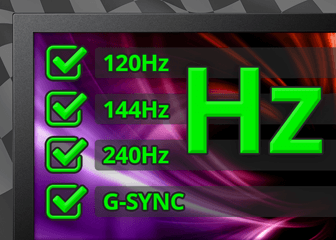 (b) edid_120hz-lightboost-plus-60hz.bin — If you also want 60Hz modes. Most approaches require the use of an older graphics card (e.g. Geforce GT 8800) since several free EDID reprogramming utilities often don’t work from newer graphics cards. When you reprogram your EDID, make sure you connect only one monitor at a time, and reprogram them one at a time. Repeat these steps for each monitor. The paid version of PowerStrip (free version won’t work for this) is capable of reprogramming the EDID of your monitor using these .bin files from a Geforce GT 8800 (and certain older cards) under a 32-bit Windows system. This is easiest done on a separate computer, so pull out an old 32-bit Windows box (even running Windows XP) and an older Geforce or AMD/ATI card, preferably a GeForce 8800 GT as it has been tested and known to work. You can borrow somebody else’s older computer for this, too. Install PowerStrip, reboot, run, select system tray icon -> Options -> Monitor Information. First, backup your monitor’s EDID, and save to a file. This allows you to undo the permanent LightBoost EDID later, if necessary. This is useful when you want to sell your monitor, for example. The EDID also contains your monitor’s serial number, which you will be overwriting! If PowerStrip cannot find your EDID, try a different graphics card. For example, a GeForce 8800 GT worked, while GeForce 8600 GT did not find an EDID. When you select “Update EDID”, you may see “EEPROM Error“, saying “An EDID EEPROM was not detected on the selected monitor. Do you want to scan the bus for other EDID EEPROMs?“. 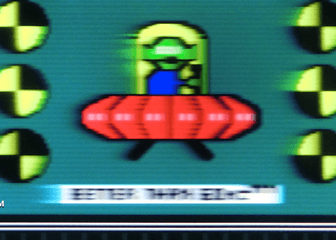 When you click Yes, you may see another pop-up message “EEPROM Found: <MONITOR>” and a message “An EDID EEPROM has been found at port #1. Do you want to attempt writing to this EEPROM?“. Click Yes. Select the .bin file and PowerStrip will flash your monitor with the new EDID. Once you’re done, go to Testing your New LightBoost. Note: The small delay (-s 0.01) is necessary, otherwise you get error messages. If you are trying to reflash other monitors, you may need larger values (especially on older models, such as the ASUS VG278H which has very slow I2C). Also, if you ever want to restore your old EDID, this is the same command you use (with the backup .bin file you saved). This is useful when you want to sell your monitor, for example. If all checks out, you’re finished with this monitor. Repeat all the above steps with the next monitor of your surround setup, until you are finished with each monitor. Once you’re done, go to Testing your New LightBoost. If you prefer to use a different EDID flashing utility, you are on your own. Be careful! The use of Tomasz Orczyk’s EDID converter [WARNING: Untested] can allow you to convert .bin files to other formats (.dat or .raw) compatible with other EDID utilities. If you discover an easier method of flashing your EDID, please post in the comments! Once done, reconnect all your monitor(s) to your original system, power them up. Install and run ToastyX Strobelight once. This is a one-time procedure to wake up LightBoost permanently, after having unplugged your monitor. Once this is done, you don’t need to run Strobelight again even after reboots (Unless you want to use Strobelight for easy adjustments, including LightBoost brightness). In fact, next time you reboot, your monitor will have LightBoost enabled during the BIOS / UEFI screen, or even when rebooting into a different operating system that automatically configures from the hardware EDID! Next, set up your surround mode (e.g. 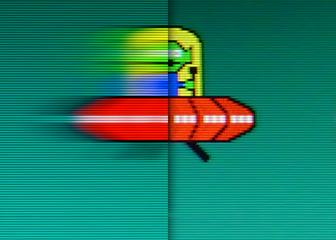 triple monitor portrait surround), and LightBoost will continue merrily working, independently of your graphics drivers, assuming the EDID was flashed correctly into your monitor. Triple LightBoost portrait surround working with latest GeForce drivers. Remember if you unplug your monitors from power, you will need to re-run ToastyX Strobelight (or 3D Vision initialization) once, to wake up LightBoost, and make it stay stuck on again. The use of the hardware EDID method does not prevent the ability of doing software-based EDID overrides using ToastyX Custom Resolution Utility (CRU). For example, even if you installed the 120Hz-only EDID, you can still add 60Hz modes manually via CRU. However, these modes will not work in surround modes. Only the hardware-installed EDID (flashed on the monitor) will reliably work in triple surround mode with the newer NVIDIA drivers. This modification should not interfere with G-SYNC, as G-SYNC uses the DisplayPort connection rather than the DVI connection. However, just in case, you should keep a backup of your original EDID, so you can reflash your monitor’s EDID back to original. Also, the G-SYNC upgrade also includes a LightBoost sequel that was revealed earlier. 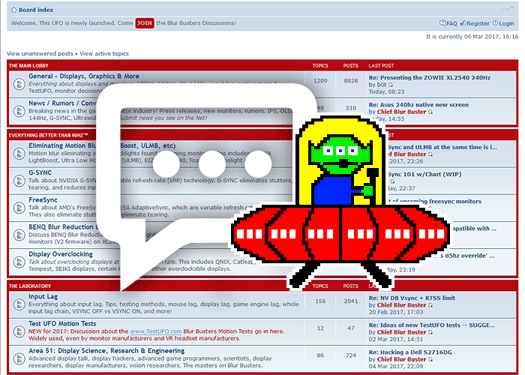 These instructions were brought to you as a Blur Busters exclusive, provided by reader Toni Wilen, the author of the WinUAE Amiga Emulator (www.winuae.net). If you have improvements (e.g. easier Windows EDID programming utilities) or a way to bypass the need to open up the display, please contact squad@blurbusters.com. Feel free to donate to Toni if he is a hero for saving your 4-figure-priced setup. If you love emulators, we’d like to note that Toni’s WinUAE has software-based black frame insertion! This permits 60Hz with reduced motion blur on 120Hz monitors. If you are looking for a new monitor, see the Official List of 120Hz Monitors. WHEW! Just modded 2 of these monitors for a friend now onto the 3rd…. I found when soldering the pin on the chip use a precision flat head – smallest you can get and torque (gently) the pin UPWARDS while touching the soldered end to desolder and just lift it up gently. Makes for a nice clean pin lift. Thanks for your work. So far, I easily used Strobelight.exe for my Asus VG278 with a nVidia Card. But now I got a Radeon 5850, and I don´t get it to work anymore. Uninstalled and reinstalled, 121 is shown in Catalyst Driver, but no Result. Strobelight.exe does not load/start. Will the hardware mod work with a laptop with a GTX 660m? Depends if you are using NVIDIA Optimus or not. If you are using Optimus, ToastyX Strobelight doesn’t work on Optimus systems where the NVIDIA graphics card is in the system at the same time as Intel graphics. It is historically extremely difficult to get LightBoost working on an Optimus systems. There are some successes, but with convoluted instructions involving a 2nd computer to initialize LightBoost before switching to the Optimus laptop, creating the custom resolution (with the 1145-Vertical Total) via the Intel Custom Resolution utility instead of NVIDIA. ps: an usbjtagnt or bus pirate is the MOST reliable way and also pretty much anything that does i2c will let u do it. WinI2C/DDC library also seems rather reliable… all the ddc comands worked on win8 64bit. (havent tested edid writing) but comes with “EDID Write VC Sample” (as i said it includes source, installs by default to C:\Program Files (x86)\WinI2C-DDC\Samples\EDID Write VC Sample ). I wanted to purchase WinI2C/DDC but the company discontinued the product. Did you obtain it before it was discontinued?